By pitching the end of another one-sided game, Chris Gimenez has already pitched in more games than any position player in almost a half-century. The real novelty of Tuesday’s 12-3 Twins blowout loss at Seattle was utility player Eduardo Escobar playing catcher. Chris Gimenez pitching? That’s old news. 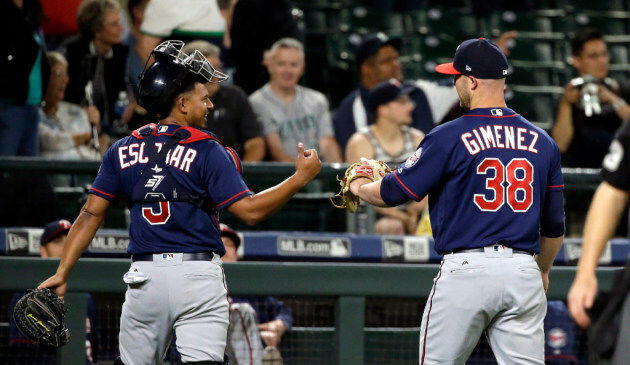 Gimenez, normally a catcher, gave the Twins’ beleaguered bullpen a rest once again, pitching in his fourth game this year. It came in the Twins’ 54th game of the season — exactly one-third of the way way through — meaning he is on pace for a whopping 12 pitching appearances this season. Now, he probably won’t get there. It takes a certain set of circumstances for a position player to get into a game as a pitcher. But it is certainly worth noting that Gimenez, per SI.com, has already pitched in more games as a position player this season than anyone else in Major League Baseball since at least 1969. The site did a piece last week after Gimenez made his third pitching appearance, tying five other players for most appearances by a non-pitcher. Now that he has four, Gimenez is alone at the top. Two of the other five players who pitched in three games did so for terrible teams. Jim Morrison did it for the 1988 Braves (a dumpster fire of a team, and I should know since I probably watched almost every one of their games in a 54-106 season on TBS). Bob Bailor did it for the 1980 Blue Jays (67-95). Doug Dascenzo and Vance Law did it for losing Cubs and Expos teams, respectively. But Law did it a second year for a 91-win Expos team, while David McCarty did it for the 2004 Red Sox, who of course won the World Series. So it doesn’t always mean a team is terrible. Again, here’s where the circumstances come into play. The main ingredients are generally 1) a lopsided game, 2) a tired bullpen and 3) a player willing to pitch. Though the Twins are 29-25 and on pace for an 87-win season, they’ve had 11 blowout losses (defined by Baseball Reference as five runs or more) already this season. They’ve been outscored 277-249, giving them an expected won-loss record of 24-30 (which would be on pace for another dreaded 90-loss season) according to a Baseball Reference metric developed by Bill James. In all four of Gimenez’s appearances, the Twins trailed by at least nine runs heading into the opponent’s presumed final inning at the plate. They had two other 11-run losses in which Gimenez didn’t pitch. On Tuesday, the Twins had already used Randy Rosario, Alex Wimmers, Buddy Boshers and Craig Breslow after a short start by Hector Santiago. Rather than burn another reliever — one of their better arms at that — Gimenez volunteered for mop-up duty. Combined with the off-day Monday, that’s a big deal for a bullpen that has seen plenty of action lately. The Twins only have one off day between now and the All-Star break, which is more than month away. They also have two doubleheaders in that span. Add it up and Tuesday started a stretch of 35 games in 34 days. So while it’s certainly an oddity to see a position player pitch, it’s not a bad strategy. And it would hardly be surprising to see Gimenez keep adding to his total. No. 1 pick prospect Hunter Greene to visit Twins -- and maybe Paisley Park?